Something I see DAILY in my work is the fear of fully meeting ones needs. Whether it’s energy needs, pleasure, rest and play without guilt, fulfilling work, etc, those struggling with food or weight worries almost all have a ” don’t want to need so much mentality”. Needs are inherent in life. 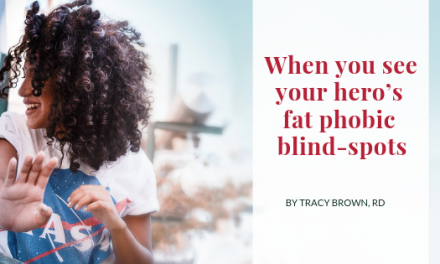 But when we have coupled accomplishment or safety with being less visible, avoiding rejection or hurt or feeling better than through our food or size, accepting our food needs can feel excrutiating, as if you are failing or are in danger. And living in a culture that openly feels it has the right to decide who gets to eat freely (not women and especially of size) and has trained us to believe we can get by with semi-starvation numbers and it’s no wonder…..
We just don’t want to do it, at least not all in at the beginning and without a lot of encouragement and desire to pursue LIFE. But let me tell you some stories of what under-nourishment looks like and how it impacts our life. 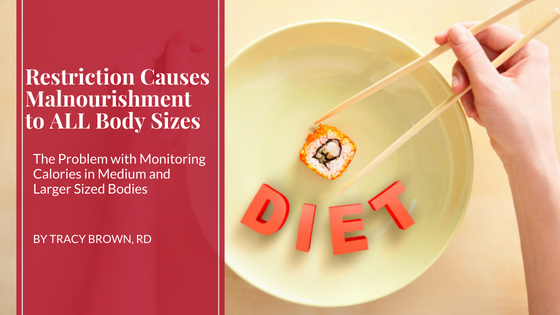 I am not necessarily talking about people who know that weight restoration is necessary to even begin intuitive eating and do the deeper work of recovery. It’s not that I don’t love you if that is your situation ( I was you once; however I want to dedicate this post to the majority of people of diversity of sizes who are inhumanely overlooked). I do think the following scenarios happen to smaller bodied people too ,however, people in medium and larger bodies are less likely to be encourage to “eat more”. when people go into inpatient treatment and are underfed and do not get the care they deserve because they are given too low a meal plan, only to come out not trusting IE, HAES informed dietitians and coaches who coach them to eat more. when people get trapped in a vortex of mistrust of providers and their bodies and the ED/diet voices start to creep back in because one provider suggest that their anorexia in a larger body “isn’t all that bad”. when a person who has diabetes or PCOS and a history of any disordered eating is told to carb and calorie restrict in an attempt lower insulin resistance. when our stress is not taken seriously and results in a history of a fight or flight looping which naturally decreases sensitivity to responding to hunger signals. People then think their brain fog, low mood and energy is a result of some mysterious disease, when it is plain low fuel from under-eating. If we have had conditioning that “you can stand to miss a meal” it can be a surprise to hear from someone like me that ‘no, your body, mind and emotions cannot; you deserve to feel well”. Clients weight suppress prior to doctors visits, insurance dog and pony shows to avoid penalties and family commitments because of the real fears of being criticized and penalized. What do you think happens to our nutrient stores in all body sizes when we restrict nutrients? We know the consequences all too well. We weight cycle, obsess, feel weak, tired, sad, apathetic, panic when our bodies change and have a hard time accepting that the way to heal is to allow the fats, sweets, carbs and hearty, juicy, nourishing meals we need. Let me give you one final story. I have 3 personal friends and relatives, all in “average” sized bodies who believed they would be happier if they were thinner, who within a year of carb and calorie restriction ALL had emergency gall bladder removal surgery. This is very common when we have fluctuations in nutrient status when we remove food groups and lose then gain weight. It is not the weight gain. It is the stress of restriction. So my dear ones, there is hope for all of this. It is in taking the big risks to learn about what your body needs this meal. Then get that feedback and respond again and again. Please stand firm in knowing that it is NOT okay or ethical for a health professional to prescribe semi-starvation in the name of health and certainly not because they think it will help your self-esteem; listen to your gut on that one and run. And please, if you suspect any healthism from a provider that would impair your ability to make peace with all foods, trust your gut that you felt that way. The damage is real from some in the eating disorder recovery world that would have you think that there is a right weight to recover at or foods to eat to “get there”. This is a “becoming process” not a gain/lose a certain amount of weight then you’re good. Just know, that people who are in the know about how the body works and that ALL bodies need to be well-nourished to be fully recovered, are encouraging you to no matter what this world says and we need you to be well-fed. PreviousPrimal Hunger – What are you hungering for when you aren’t sure you’re feeling hungry?